It's another entry in Panel Patter's SPX SPOTLIGHT series! We've been highlighting creators, publishers, and comics related to SPX since the site opened in 2008, but 2015 marks our fifth year of extensive coverage that is unlike what you'll find elsewhere! It's a great way to create your own personal guide for the show on September 19th and 20th, 2015, in Bethesda, Maryland. Don't miss it! You can find all our SPXSPOTLIGHT posts here. 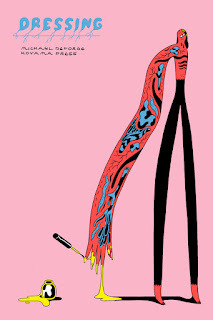 Michael DeForge’s comics make me extremely uncomfortable. Maybe they are even frightening as the short stories in Lose #7 and Dressing have these visions of existence transformating into something more than human or even maybe just more human. Whether it’s a girl’s father slowly metamorphosing into his just-discovered celebrity brother (Lose #7) or Mars colonists slowly losing their own humanity and truly becoming Martians (Dressing,) DeForge twists our ideas of identity into deformity and into beauty of our potential transformations into a new creation. It's frightening but exhilarating. Lose #7 has three stories in it, the most prominent one being “Movie Star.” A girl takes care of her sick father, having movie nights with him as she tries to nurse him. His life seems be be over and her life never really got started. Kim should be out on her own but she has responsibilities and fears all tied into her father’s condition. One night they have an uncomfortable laugh as she jokes that the star of a movie they’re watching looks a lot like her father. From there, the story becomes this bizarre story of her father discovering a brother, a sister-in-law and a family apart from his daughter. DeForge follows the father’s metamorphosis down this oddly twisting path that doesn’t leave room for his daughter in his life. From Lose #7- "Movie Star"
That fluidity of identity ties the stories in Lose #7 together, as each of the three tales experience their own different transformative journeys. His characters are never static. He views their lives as a constant state of flux as they’re constantly influenced by outre stimulus. And that stimulus is hardly ever kind or benevolent so its power over his characters perverts their and our ideas about who they are. The father of “Movie Star” becomes an extension in every way of his discovered brother. The little girl in the issue’s first story listens to her friend and physically transforms herself in the way that kids think they can when they shut their mouth, pinch their noses and try to blow, inflating her head and other body parts to become her idea of what an adult is. These people go through transformations with no understanding of what they’re actually becoming. The stories in Dressing could be described in similar ways. But more than just the characters going through changes, it also has stories where characters are recognizable but their environments are completely surreal. The through line in all of these stories is the uncertainty of our own defined perceptions of ourselves. DeForge makes us explore this concept from many different angles narratively as well as visually. The stories would be odd enough if told from a point of view that tried to represent everyday reality, like a Chris Ware or Dan Clowes. Either of those cartoonists would bring their own idiosyncratic approach to the stories. Those may be distant and removed approaches as they tried to find their way into humanity. 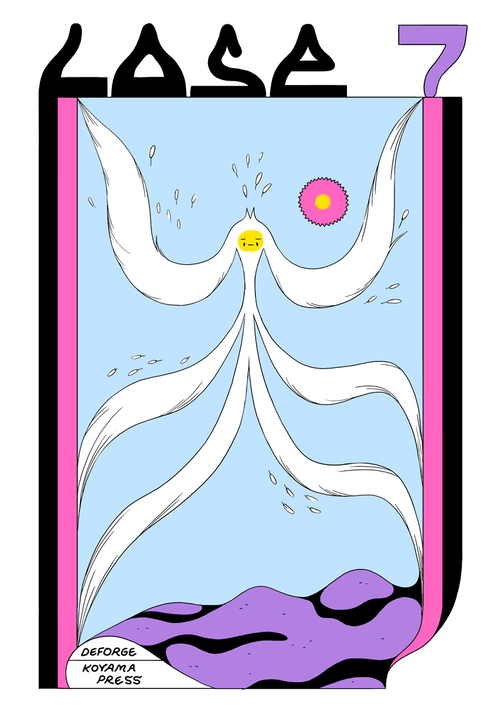 DeForge’s stories are far more alien than either of those cartoonists because his art, full of geometric forms, immediately removes an easy way into the story because he’s not drawing the world you or I see but a world that exists under our skin. From Dressings: "Mars Is My Last Hope"
His stories make us think about the nature of ourselves but his art makes us contemplate the outre nature of reality. It’s the case of his abstracted forms making nothing and everything real. That’s where his stories become frightening. His cartooning strips away almost all pretensions of normal everyday life as he reduces reality to some platonic ideal of reality. Lose #7’s “Movie Star” is possibly one of the stories that most looks like the world outside of our windows but it’s still a very geometric and freakishly ordered world that contrasts against the chaos of the characters’ lives. Chris Ware does the same kind of drawing, creating this codified view of reality that is really nothing like what his characters are emotionally experiencing. It’s what makes people think that Ware is a cold cartoonist. For DeForge, he's laying bare our expectations. He demands that we move beyond perception into experience. With DeForge, reality becomes a horror show not of blood and gore but of uncertainty. Reality is shaky ground in his stories in Lose #7 and Dressing. His stories of changing identity combined his existence-warping artwork make us question our own concept of self. Could the reality that DeForge tells stories about be more real that what we experience every day? You can’t come away from either of DeForge’s works (or really any of his books) without questioning the world around you. 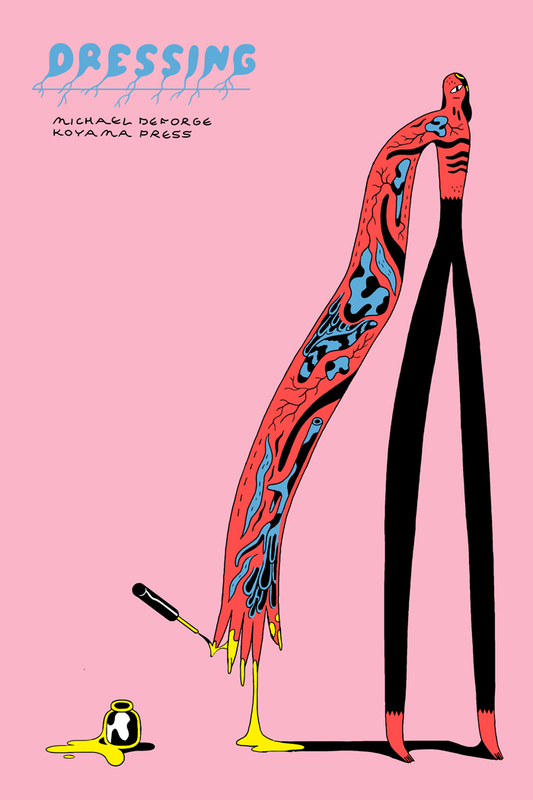 You can find Michael DeForge online at his website or on Twitter. He will be at SPX2015 at tables L1-2.